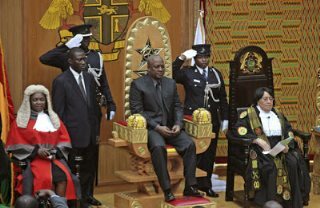 AFRICANGLOBE – Here in Ghana, if the Supreme Court can sit for several hours a day and several months in a year to determine which candidate(s) won the general elections, but NO court in the country finds it useful to hold these same politicians accountable for their failure to fulfill their campaign promises despite having all their annual budgets expenditure approved by the parliament to enable them fulfill their campaign promises, then I think we have an illusion of justice in the country as long as accountability is concerned. The last time I checked, the Coat of Arms which is the official seal of the government of Ghana, suggested that the motto of the Republic of Ghana still remains “Freedom and Justice”. Yet I am yet to see the day for which politicians will be brought to justice for woefully failing to deliver on their campaign promises to the electorate. If a contractor can be arrested for failing to deliver goods and services for which he has been paid, why can’t our politicians face the same fate when they fail to deliver on campaign promises after receiving massive loans in our name? Are the politicians above the laws of the land? Where is justice? It is a common ritual to see our finance ministers presenting annual budget statements to parliament at the beginning of every year, seeking approval for such huge moneys to be approved for the fulfillment of their campaign promises to the people of Ghana. Yet at the end of the year when they fail to fulfil the said promises, nobody holds the politicians accountable for the failure of the government to fulfil the promises for which such huge moneys were approved. What is even more annoying is that at the beginning of the next year, the same minister will have the audacity to present a much bigger budget before the parliament house seeking approval. When are the courts ever going to hold these politicians accountable for their failure to on their promises? “120. The construction of LPG satellite storage depots at Kumasi, Savelugu and Mami Water will commence while the storage capacity for LPG at Tema and Takoradi will be expanded. 121. For the implementation of these programmes and activities, the ministry of energy has been allocated an amount of GH¢657,132,393.00” (Paragraph 120 -121). As I type this piece, only God knows where the said money went, since no single one of the above-mentioned projects to show for. People in the Kumasi Metropolis have been struggling with water shortage and unreliable electricity for months. So where is the money? Why is the media not asking questions? 126. The Accra-Nsawam and Kumasi-Ejisu railway lines will be rehabilitated to increase sub-urban rail service. In addition, the reconstruction of the Western Corridor Railway Line will commence under the China Development Bank (CDB) Facility. 127. The Takoradi Port Expansion Project and the Multi-Modal Transport Project that links the Tema Port by rail to the Volta Lake and coastal fishing harbours and landing sites will be undertaken. 128. A total of 54,084km of routine and periodic maintenance works will be undertaken while 250km of spot improvement works will be done. 129. Madam Speaker, in fulfilment of its pledge to complete key road infrastructure around the country, Government will in 2012 complete the construction of the following major highways commonly referred to as the “Gang of Six”: Achimota-Ofankor, Dansoman highway, La-Teshie expansion project, Tetteh-Quarshie-Pantang and Nsawam By-pass (Accra bound). Construction works on Sunyani Road (Komfo-Anokye to Abuakwa) and Kwafokrom to Apedwa Roads will continue”. Therefore where are those railway projects in Kumasi? Has the existing, appalling Accra-Nsawam and Kumasi-Ejisu railway lines ever seen any renovation or expansion in recent years? Are there any railways under-construction in Kumasi for that matter? Having voted a huge amount of money for the said Kumasi-Ejisu railway lines, I am still not aware of any projects recently commissioned in Kumasi to that effect. The continues failure on the part of our politicians to deliver on their promises to the people, should provide a reasonable justification on the urgent need to criminalized unfulfilled promises especially the ones for which government moneys have duly been allocated. 170. “Ghana’s existing rail network is confined mostly to the southern part of the country which is economically more advanced and has a higher population density. Nonetheless, the current rail network is characterized by old tracks and rotten coaches, and inadequate railway terminals, stations and platforms. 171. Madam Speaker, Government will source funds to rehabilitate and/or totally re-build and modernize the rail sector. 172. Madam Speaker, the recently commissioned Accra-Tema railway line will be extended from the Tema harbour area to Tema Community 1 to improve the suburban railway system”.